I’m thrilled to announce the launch of the Women in the Middle podcast! It’s been a long time in the making and I’m really excited to finally share it with all of you. 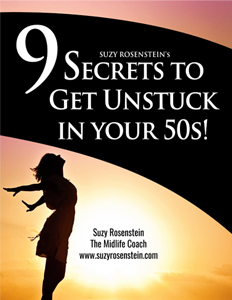 Midlife in your 50s doesn’t have to be about watching your life pass you by. You don’t have to feel stagnant and fearful of regrets. It’s your time to re-learn how to put yourself first again and satisfy your need to grow. To celebrate, I’ll be giving away 1-hour coaching sessions to ten lucky listeners. Keep on reading to find out how you can enter! Every episode of Women in the Middle will be packed with the mindfulness skills, tools and perspective you need to live intentionally, learn how to dream again, and create a life you love. And while I’m dedicated to sharing actionable advice, we’ll be having lots of fun as well. This week, I’ve posted three episodes to help you get to know me and how this show fits into your busy life, with new episodes being released every Wednesday morning after that. Ep #1: Welcome to the Women in the Middle Podcast! 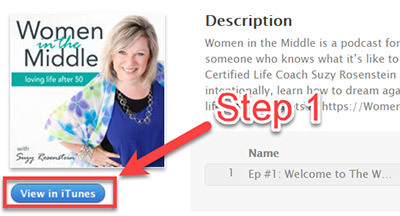 To subscribe in iTunes, visit the Women in the Middle podcast page and click on the blue “View in iTunes” button. This will launch iTunes on your computer and bring up the podcast. Click on the “Subscribe” button and you’re all set! You can also listen to the podcast via Stitcher Radio. I’ll be giving away 1-hour coaching sessions to ten lucky listeners who review the podcast in iTunes during the first few weeks. 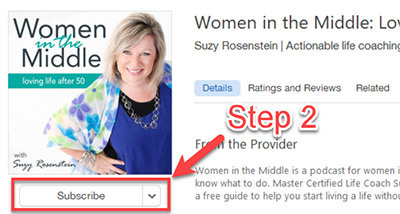 How to Win: Once you’ve listened to an episode or two, click on the “Ratings and Reviews” link on the Women in the Middle podcast page in iTunes to leave a review. Any review qualifies you to win: I want you to be honest and really tell me what you think and how I can I help you better. Reviews must be submitted by September 21st at 10:00pm EST to be eligible to win. Unfortunately, iTunes doesn’t release contact information for reviewers so please email me at Suzy@womeninthemiddlepodcast.com with the title of your review for your official entry. If you haven’t yet, make sure to subscribe in iTunes now. Thanks for listening!